The Australian Federal Government has announced a two year trial of a new Satellite-Based Augmentation System (SBAS) for the Australasian region, supported by an investment of $12 million in federal funds and a further $2 million from the New Zealand government, this according to a report in Spatial Source authored by Daniel Bishton. The trial will be the first in the world to test the Precise Point Positioning (PPP) technique’s integration in an SBAS service and will be managed by the Australia and New Zealand CRC for Spatial Information (CRCSI), in partnership with Inmarsat, GMV and Lockheed Martin. Land Information New Zealand (LINZ), the government department responsible for mapping landscapes and charting New Zealand waters, will oversee the New Zealand’s involvement in the project. Businesses and organizations from ten industry sectors including agriculture, aviation, construction, consumer, maritime, rail, road, resources, spatial and utilities will also participate, with over 30 specific projects anticipated. The trial is intended to test the performance of the technology directly across industries; current industry-specific requirements and how they interact with the technology, and future industry-specific innovations that may leverage the technology. The outcome of the trial will in part determine if Australia and New Zealand should develop an operational SBAS. SBAS is a form of GNSS augmentation — techniques to extend and improve the accuracy, reliability or availability of GNSS systems. SBAS systems use additional satellite-broadcast messages, typically using ground stations at surveyed points to record measurements from GNSS satellites, their signals and environmental factors that could impact them. Messages containing these data are created from these measurements that are sent to the SBAS satellites, and then broadcast to end users to improve GNSS capabilities. Matt Canavan, Minister for Resources and Northern Australia, formally launched the trial last Thursday at CQUniversity Australia, one of the first industry participants to sign on. 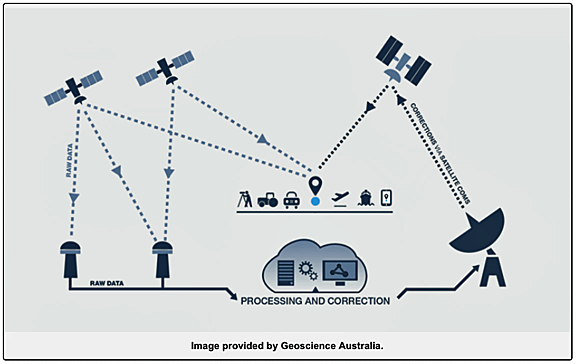 This trial will use the national GNSS system operated by Geoscience Australia, taking data from the AuScope GNSS array and providing it to a computation unit running GMV software, also based at Geoscience Australia. Corrections will be sent to the Lockheed Martin facility at Uralla, New South Wales, and then uploaded to the Inmarsat 4F1 satellite. The 4F1 satellite, orbiting at 143.5 degrees longitude, will then broadcast the corrections over the Australasian region. Australian GPS users should be able to track the SBAS signals from their devices and see improved positioning accuracy, however the SBAS test-bed will not be certified for safety-of-life use.